SPINOSAURUS — NEW, IMPROVED, WITH ADDED FEROCITY! Whew! That Spinosaurus aegyptiacus just barely missed me! Sometimes I long for the days of the slow, tail-dragging dinosaurs. 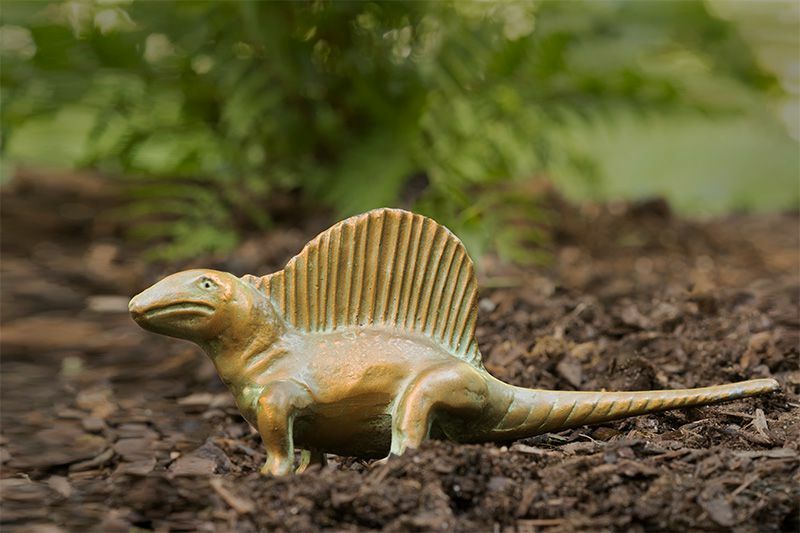 Remember Dimetrodon? My husband has had this model since he was a kid. Kind of a cute critter, huh? Even if it wasn’t a real dinosaur, that Dimetrodon certainly knew how to rock its dorsal sail back in the Triassic, approximately 280 million years ago. Time marches on and long after Dimetrodon went extinct, a Cretaceous dinosaur came on the scene with another incredible dorsal sail. Enter Spinosaurus aegyptiacus. Paleontologists recently announced the recovery of a number of new fossilized bones from this 50-foot long theropod. This beast was 10 feet longer than T. Rex— and still growing! The first photo is one interpretation of what it may have looked like. But be warned: there is controversy about the accuracy of this reconstruction. Because a reasonably complete skeleton has never been found, this model necessarily represents a combination of different fossils from different individuals. Some may have been bigger than others; some might be juveniles and others adults. Also, these discoveries were made at different times in different geographic regions, and some bones could have been twisted or compressed before they were fossilized. In addition, a lot of bones have never been found and must be inferred from those of related species. So the latest version of Spinosaurus may very well change if/when more bones are discovered. In any case, how could you not be awed by this 97-million-year old Cretaceous beast that could eat sharks? Though it was found in a very dry part of Morocco, it lived in a riverine environment, and may have been aquatic, at least some of the time. Why do some paleo-biologists think so? First, Spinosaurus had dense, heavy ribs and long bones that could be used for ballast in the water. Second, its large, conical teeth and jaws are well designed for eating slippery fish and cracking turtle shells. Its jaws certainly have a crocodilian look to them. Spinosaurus may have had pressure-sensitive receptors on its snout enabling it to detect prey underwater. It also had nostrils placed like those of a crocodile so it could breathe while swimming. However, there may be other land-dwelling dinosaurs with similarly placed nostrils. Though some disagree, it’s been asserted that Spinosaurus‘ back legs and feet would have been better adapted for swimming than walking on land; those back feet might even have been webbed. Plus, there was plenty for Spinosaurus to munch on in the African rivers of the Mesozoic. It could eat fish the size of a car. If you’re in the D.C. area, you can get a look at it in the National Geographic Museum. So did this fellow evolve from Dimetrodon? Unlikely. While both beasts had “dorsal sails,” this may be an example of convergent evolution. That happens when unrelated species evolve similar traits or features independently, which are used to perform similar functions. As the saying goes, form follows function. Which raises the question, just what is the purpose of those seven-foot long spines on its back? The conventional thinking is that they are for “display” – to attract a mate or warn away others of its kind who might fancy the same mate or the same territory. Really? That’s an awful lot of energy for display. Besides, wouldn’t some of its prey see that fin coming a mile away? Another intriguing hypothesis is that it served as mechanism for storing fat, which it could convert to energy. It’s also been suggested that it was used as a means of propulsion in the water as it may have swung its tail when swimming. Or, it could have been a way to regulate body temperature by dissipating heat, which seems to be the case with Dimetrodon. 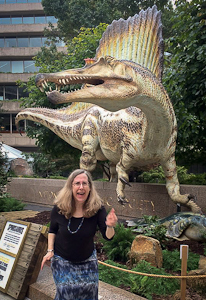 If you live in the DC area or are visiting any time soon, you can see this life-sized re-creation of Spinosaurus outside the National Geographic Museum. A full-sized skeleton is on display inside.